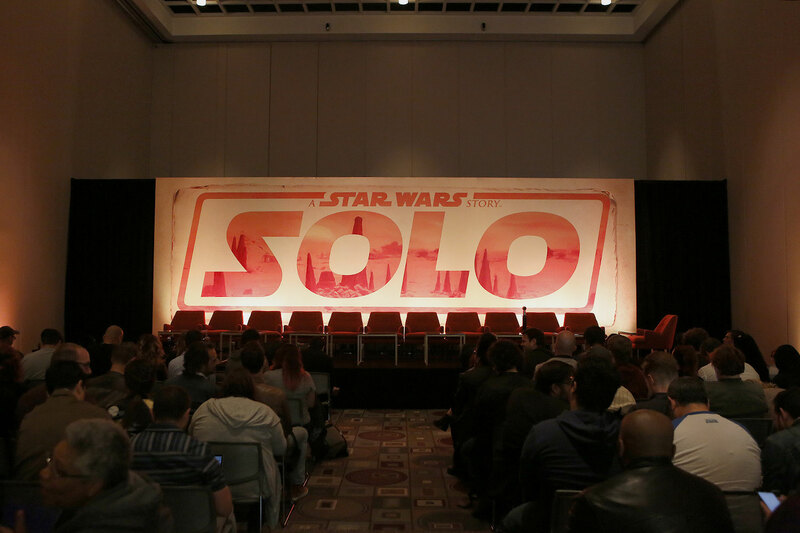 SOLO: A STAR WARS STORY is just about ready to launch into theaters everywhere and we’re thrilled to finally be able to see it again with the rest of the world. 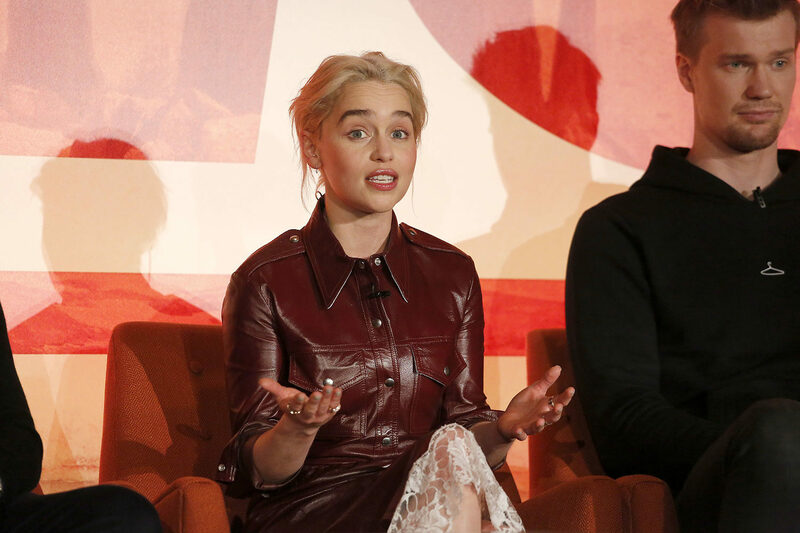 The press conference for the film took place just a few weeks ago in Pasadena, CA with director Ron Howard, cast members Paul Bettany (Dryden Vos), Joonas Suotamo (Chewbacca), Emilia Clarke (Qi’ra), Alden Ehrenreich (Han Solo), Donald Glover (Lando Calrissian), Woody Harrelson (Tobias Beckett), Phoebe Waller-Bridge (L3-37), Thandie Newton (Val), and writers Lawrence Kasdan and Jonathan Kasdan. 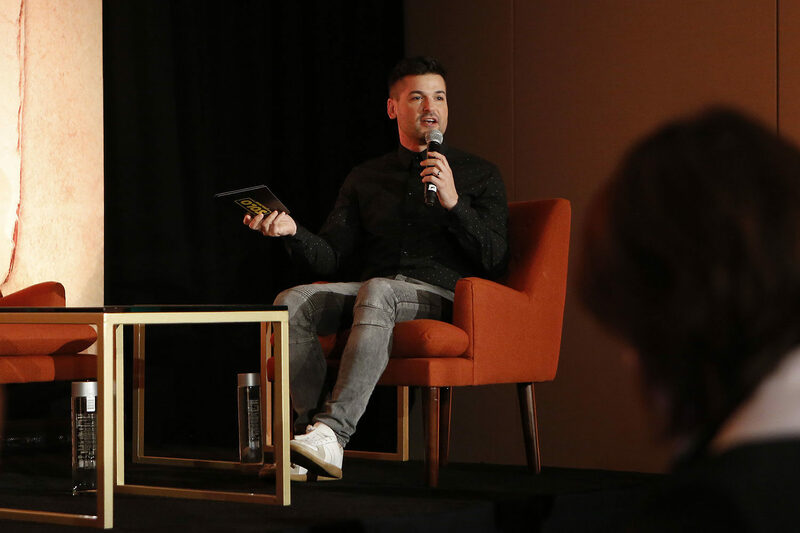 The panel was moderated by The Star Wars Show’s Anthony Carboni with a few press questions at the end. The conversation detailed some of the fun and challenges the cast had but mainly it was interesting to hear from the Kasdans and Howard about the making of the film. Below are some of the highlights from that afternoon, edited for clarity. And don’t fret, no real spoilers below, but feel free to read after seeing the film! RON HOWARD: (on practical vs CGI effects) As great as visual effects and CGI is, only the great CG effect supervisors will tell you, in-camera is always what you want to go for first. And so, you know, with the Millennium Falcon and with the great sets and so forth, the approach here always was to try to get as much in-camera as you could, and then build — and that’s what’s so magical and amazing about ILM and what they can do — to make, you know, the experience as palpable and immersive as it could possibly be. It’s a blast. Because the people around a movie like Solo are so dedicated to not just what’s existed before, but what else they could do within that framework, that universe, that galaxy — and creatively it’s… unbelievably stimulating for a filmmaker. Bradford Young (Director of Photography) did a great job. The look, which is a little different than the movies have looked before and an esthetic, you know, that I thought was incredibly exciting. LAWRENCE KASDAN: (on the story of Solo) Well, the story hadn’t been bubbling for a long time. What had been bubbling for me was from the moment, when I was relatively young, and I first saw Han Solo in the cantina and I immediately sparked to him. He lifted up the whole movie instantly and I loved the movie. But at that moment I thought, oh, this movie’s just got me. This is the kind of character that I have loved always and it’s been so important in all the movies that I care about. This is a character who’s reckless, who’s cynical, who doesn’t trust anybody. It’s a little bit stupid. I love that. [LAUGHTER] He just does things he shouldn’t do. He gets in over his head instantly and you can see that in the brilliance of George Lucas’s cantina scene. It’s just a few minutes and you get everything about who this guy is. 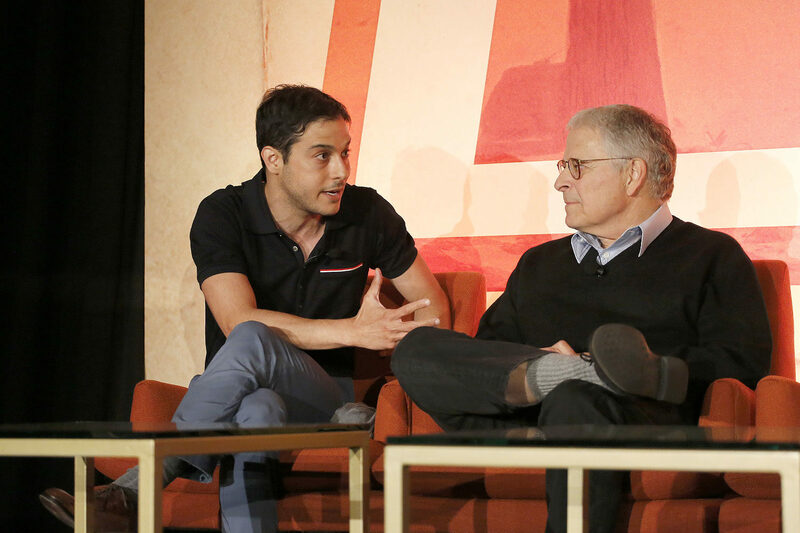 JONATHAN KASDAN: And I think he wanted me to write it with him because I am all those things. [LAUGHTER] No, I…[LAUGHTER] It was funny because… Larry had decided to get involved in Star Wars based on Han. That was the movie he wanted to make first. He got pulled into Force Awakens and when he came out he said, “I need somebody to do this with me,” and I was sort of the obvious choice for the above reasons. But also because I shared a deep love of this and I came at it from a totally different place than Larry did. 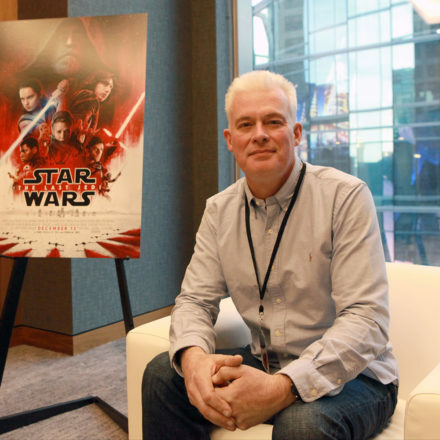 I had grown up with Star Wars; I’d grown up playing with the toys and we thought that somehow between our two dynamics, between me as a fan and him as an older Jedi master, we could figure out some sort of dynamic where we could forge a story that felt both sort of contemporary and true to the spirit of Solo. 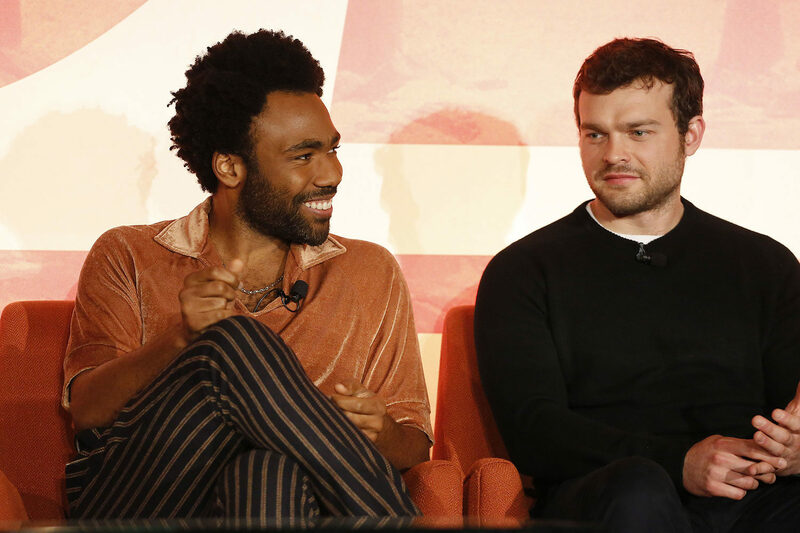 ALDEN EHRENREICH: (on shooting on the Millennium Falcon) Yeah, it… it’s really wild, it’s really exciting. It’s kind of bigger than you can even wrap your head around. Um. And it’s, it’s wonderful — particularly being in the Millennium Falcon is very, very cool. And very much like being in the cockpit — you know, you kind of get into the cockpit — for me it was, it was two things — one, you get in and you can’t believe you’re in it and it’s so surreal and that’s what everybody you bring to set wants to see and they have that experience, too. And then, you know, a couple months into shooting in it, you’re inside of it and you’re flying it. You know where the buttons are. You know how the chair feels, you know the yoke and you feel like, okay, this is kind of like my ship now. [LAUGHTER] And that is a… deeply, ah, gratifying. 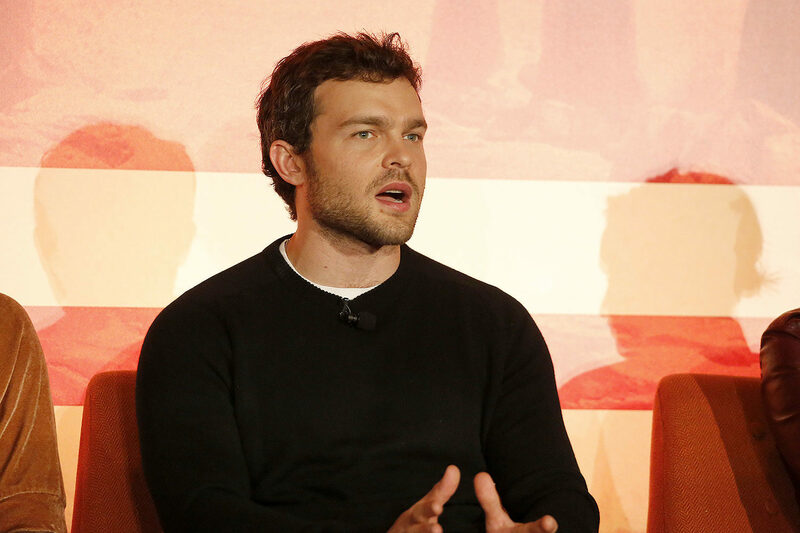 ALDEN EHRENREICH: (on being surprised by Harrison Ford mid-interview) Unbelievable. Oh my God. So I had lunch with him right before we started shooting, I wanted to talk to Harrison, just to kind of pay respect and have him give us the blessings… for the film and — so we had lunch. I guess, ah, two years ago or something and, and he was really encouraging and really supportive and then we went off, shot the film and everything like that and today I was doing an interview and they were talking about, you know, is there anything else you’d like to ask him? Because he’s — and I was like, well, I don’t know and they’re like, well, you’ll have your chance — and he was behind me. He came. [LAUGHTER] And ah… and just… he’s so effusive about the movie. And um — and it meant so much to me and I know for Ron and the Kathy and everybody, you know, it’s just such a huge deal to have him, um, really genuinely love it. And really genuinely enjoy the film and it meant a lot to me that he took the time to come out here and do that. ALDEN EHRENREICH: (on whether or not he studied Harrison Ford’s earlier films) Yeah. Like the way I went about it pretty much was to watch the original movies very early on. And just kind of absorb as much as I could both of you know, I think mainly the character, you know, how the character is operating in the world. Harrison and the whole Star Wars universe, which is so rich and there’s so much to it — and so I tried to kind of take in as much of that as I could very early, because I had the role for quite a long time before we actually shot. And then move into working on the part and kind of put all that aside and forget about it and, and play this guy where he is now in his life, because it’s most important, I think, that it feels like a real person. And so, yeah, so then I kind of moved into working on where, on this story, this moment in time. Yeah. 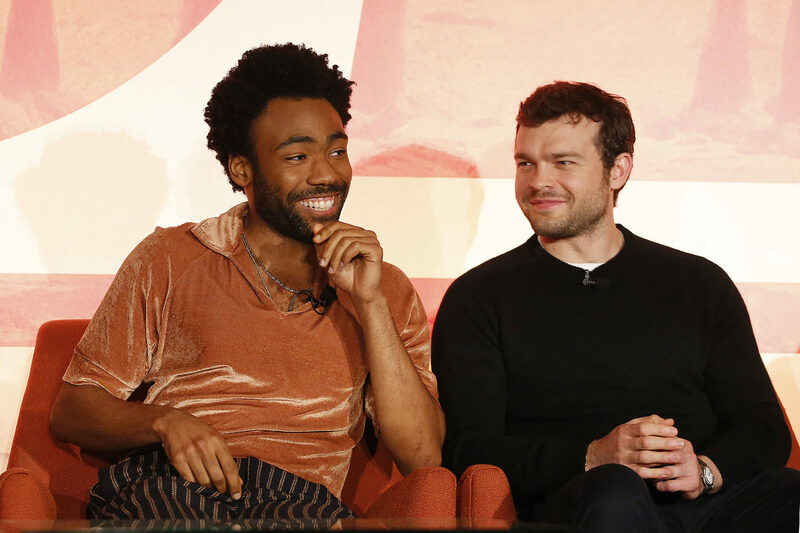 DONALD GLOVER: (on taking the role of Lando) When I heard they were making these, I told my agent, I was like, if they’re making anything with Lando in it, I have to be Lando. And… and he was like, I hear you. I don’t like your odds. [LAUGHTER] And that was exactly what I needed to hear. Like, ah… Because I… I really did like… audition like it was like the only role I wanted in the world, because it really was so… um… I’m just really happy to be part of this experience of it. 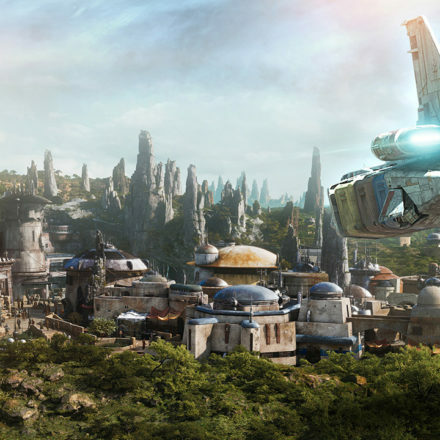 It’s really cool, but yeah, like, yeah, my dad kind of… imprinted me with this kind of Star Wars’ longing. Because it does feel like the Bible to me in a lot of ways. 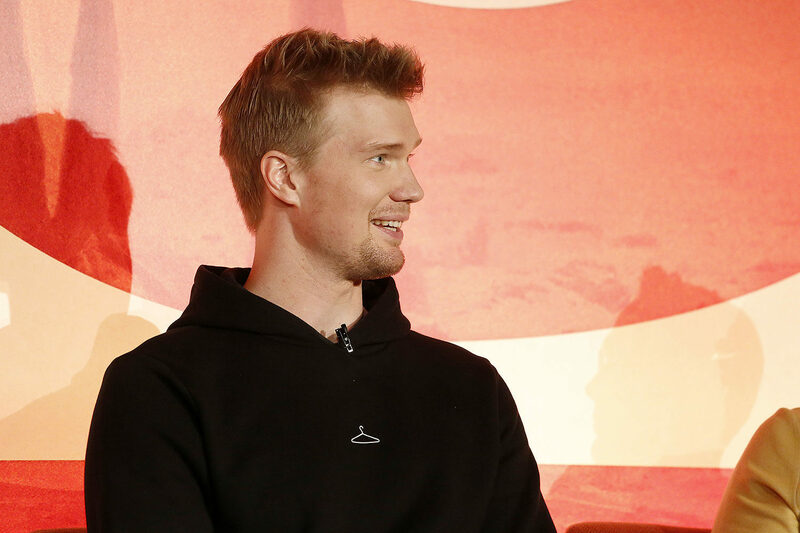 JOONAS SUOTAMO: (on playing Chewbacca) When I got to know that I was going to playing this character, I really couldn’t sleep at night and I was so excited because… this was a life-changer for me. I was, I mean, I was… borderline… jobless… when I, when I got this role. [LAUGHTER] You know. So… I mean, my… my now fiancée, my then girlfriend have seen me going from living with my mom to becoming Chewbacca. [LAUGHTER] That’s, that’s the span of our relationship right now. [LAUGHTER] And she is — I’ve been like this the whole time. It’s just now that this behavior suits me. [LAUGHTER] That I… it’s funny because this character is so loved and Peter Mayhew, who created this character along with George Lucas, has been so instrumental in, in help… giving me his blessing. 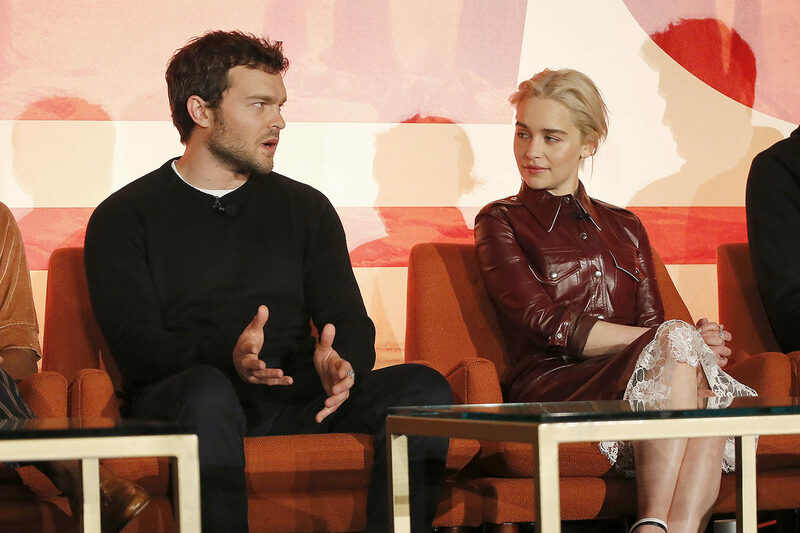 EMILIA CLARKE: (on playing Qi’ra) It was really fun. It’s really difficult to talk about because she is a pretty mysterious character. You kind of need to keep tabs on her throughout the movie and so I’m promoting a movie that you can’t really speak too much about. She is one of the harder ones to discuss. WOODY HARRISON: (on playing Beckett) Well, I thought it was a really easy character for me to play, because he’s a scoundrel and a thief and… [LAUGHTER] ah… but I think really well-written and… I mean… that’s the thing, that you have to be aware of. A lot of people who are Star Wars fanatics, this is their favorite Star Wars character which was really cool, but Larry and Jonathan really wrote an extraordinary script and, ah… and just at the right time, Ron came in and, and did his magic and then you have all this, these wonderful characters and… so it’s pretty cool to get to be in a Star Wars — it’s also phenomenal. THANDIE NEWTON: (on working with the cast) Oh, God! I mean, we were just… we would have fun. I mean, there were — they were in extreme situations sometimes. The battle sequences. I mean… this room is honestly a quarter of the size of the, you know, cavernous spaces; it would be completely taken over. The production design is so amazing. That we would feel like we were in, like real sort of battle scenarios with explosions going off and, and debris and you know, like mud in places you didn’t even know you had places. You know what I mean? [LAUGHTER] Like really, it’s like a nightmare. Um. And the camaraderie between us was just humor, always was humor. Just the… you know, we — and because obviously we’d been shooting for a long time and, you know, some of the stuff that you share and, and you know, actually taking the piss out of each other all the time, because you know, there would be a lot of, you know, situations where helmets would come off and got smeared and things would go wrong — a lot going wrong, by the way. [LAUGHTER] Um. That camaraderie was really felt. We were really going into battle together. I mean, obviously, a sort of fantasy, fun battle, but… we’re still going into battle. 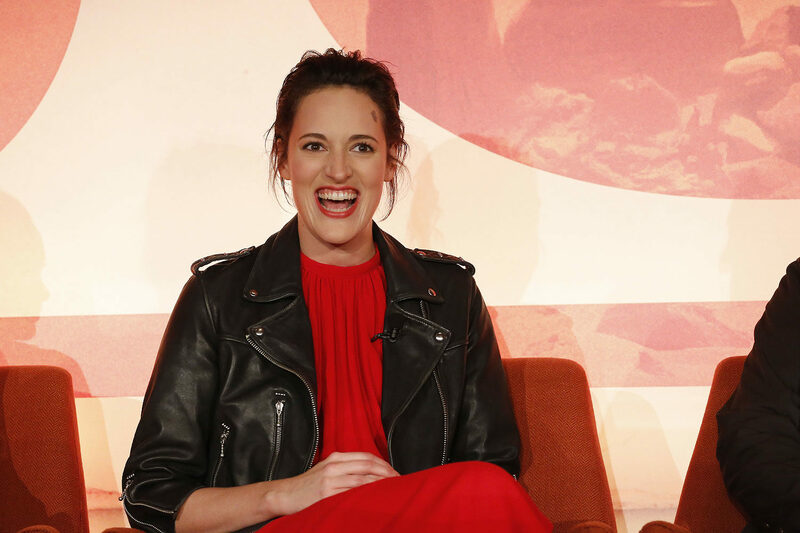 PHOEBE WALLER-BRIDGE: (on playing L3-37) Well, L3 is a real inspiration to me, so thanks, guys. [LAUGHTER] She’s… she’s a self-made droid, so she created herself out of parts of other droids. It’s… sounds kind of frightening, actually, when I put it like that. [LAUGHS] It’s like, where did you get those bits? Um, but she creates herself out of astromech droids and protocal droids so she turns herself into a unique creature that’s kind of taller, stronger… more independent than she originally was. So… yeah, she’s got a great attitude and she’s very upbeat and really fun to be around. She’s a… yeah, she’s fearless, she’s uncensored, she’s very funny and… and she has… and she’s a revolutionary and she has an agenda, which… is bigger than the sum of her parts, which is something that’s really extraordinary… for… her character and it’s great to play that, great to play a droid, you know, with a message. Yeah, she’s great. PAUL BETHANY: (on his approach to becoming Dryden Vos) Yeah, he’s a lot of fun to play and you know, again, it’s written really beautifully; thank you, guys and, and… I… having texted Ron, having said, um, hey, Ron, um, you haven’t spent long winter evenings like I have wondering why you’re not in the Star Wars franchise? And he said, give me a minute. 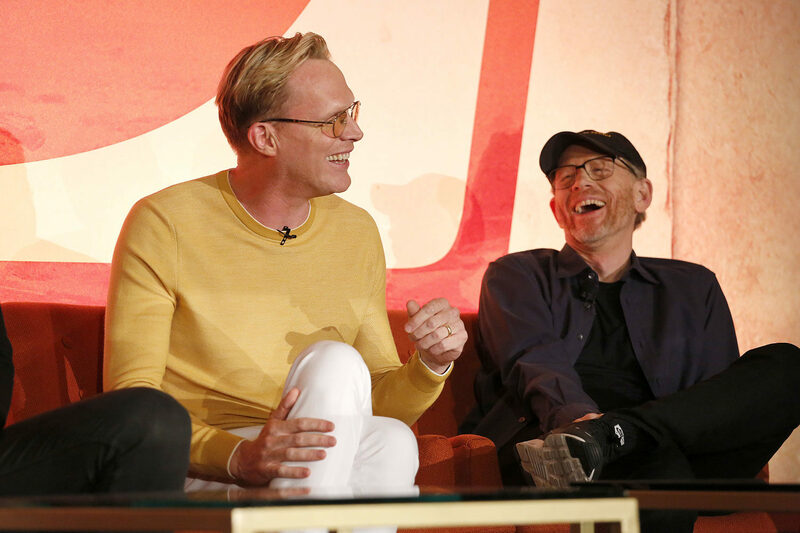 So I sort of… I came on set really quickly and he whispered, “Oligarch,” in my ear and I went, “Got it!” and I… it was just… lovely to play somebody, having, you know, come from Avengers where… Vision is fundamentally good. Just somebody who’s just deliciously bad; I’m really okay with it. Just… no neurosis. No guilt. Just super happy about being evil. RON HOWARD: (on where to fit brother Clint Howard into the film) Well, it was pretty damn easy. I did come into it, you know, late and there was a lot of work that Phil and Chris had done and unfortunately, with creative differences, there was this circumstance where they were, you know, they were not going to carry on. And within that, there were a lot of things that were really strong and already worked and knew we wanted to keep in and other things that hadn’t been done yet — and other scenes that were — I was given the opportunity to sort of experiment with and explore and I sat down with Larry and Jon and we started talking about this, that and the other and, and there was this… this great sort of scene with L3 and… and it just sort of came up in conversation, you know, that L3 needs somebody to be pissed off at. And I said, “My brother!” He is kind of easy to be pissed off at. And he’s kind of funny when he’s doing it. I love working with him. He’s a great character actor. 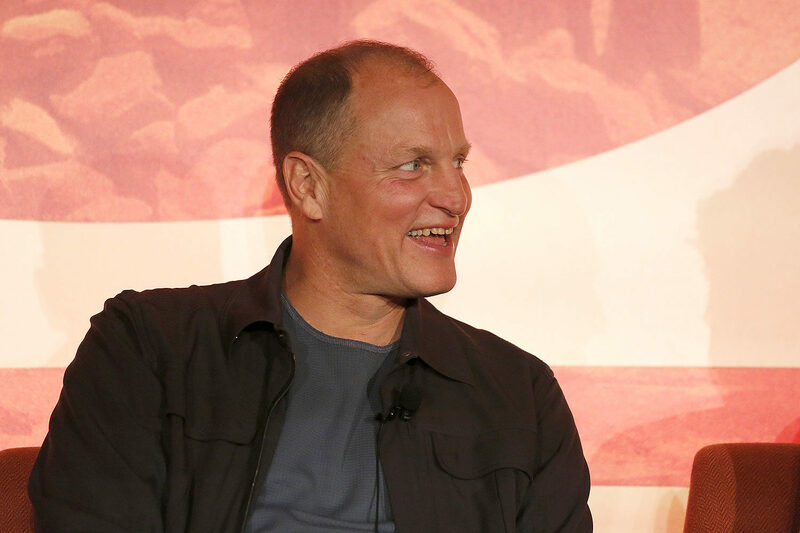 He’s funny, he’s smart, he’s a great team player and he’s not in all my movies because if there’s not something really juicy and fun for him to do, ah, you know then, then of course, I don’t cast him. But in this, in this, in this case I knew it would be fun and, and he had a, you know, had a blast doing it. 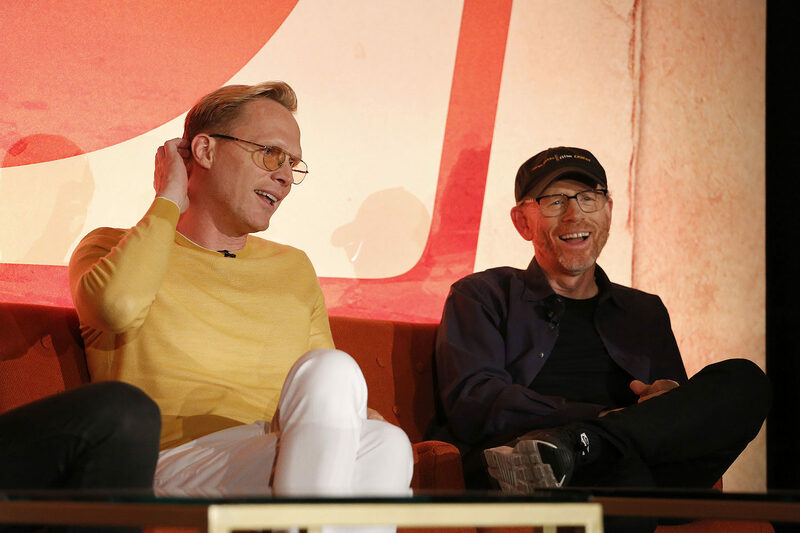 RON HOWARD: (on filming Solo) I think in terms of challenges, that for, for me the… you know, I… I’m very excited about the character relationships. Because this is a little bit different than the other movies. It’s really this… this one guy’s adventure story. Why I feel like it… in some ways it’s kind of similar to Raiders of the Lost Ark, which Larry also wrote — it is a single hero’s journey and then there’s a lot of fun in that journey and there are a lot of twists and turns, but it’s really about that character. We had that going with this. And so all of the different relationships were very important to me because it was… all about what impact these… all of these characters are going to have on, on this young Han Solo. So that was interesting. But what surprised me was how complicated and exciting and fun it was to stage the big action scenes, which is something that I hadn’t done in a long, long time. And they were complicated and sometimes it was hard and sometimes it was physically difficult… and we would change things and add and revise. But… the, the excitement was again, making even the action scenes, be cool, be Star Wars — but really be about… testing Han Solo. What does this mean? What does this tell us about Han Solo? And so it, it sort of defines the way the action scenes would be cut, would be shot and roll out and, ah, it was challenging, but it was really run and exciting to work on. And the big surprise for me is what a blast it was, to do this action. RON HOWARD: (on Warwick Davis) What a great guy. You know of course, he did Willow, but he, he’d, you know, he’d been an Ewok before that and so you know, so he’s a, he’s a tradition and another master. And the other thing is, is that he, he helps out with a lot of it, a lot of the characters and a lot of the droids and things like that and he will come in and, you know, he does, he goes uncredited. He loves it. But the, the company is smart enough to bring him in and not only play a character, but also help with coaching and setting up and figuring out some of these behaviors and he’s a really creative guy and an old friend and it’s great to reunite with him. 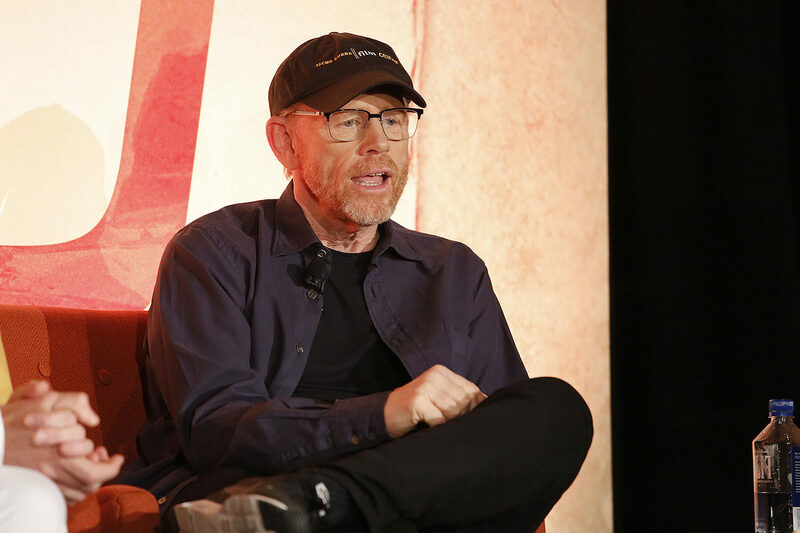 RON HOWARD: (on Star Wars mythology) I’m a fan, and… and I’ve always appreciated the movies, but I’m not encyclopedic. I don’t know everything. I haven’t seen everything. I haven’t read everything. And so I came into this situation and immediately, of course, I had to start working more off of instinct than anything else, and this great screenplay, that I really believed in — and a cast that I, I certainly wouldn’t have come onboard if I didn’t love the cast and was excited about working with them. But — I immediately said, you know, I’m going to treat this like it’s a true story. I’ve done a lot of true stories. And I always have technical advisors around. And I sort of go for the heart. I go for the drama, the excitement of the narrative, of the story and then I let the technical advisors tell me, you know, where else it could go or what I might be overlooking. And that’s honestly the way I approached this. And so many people around it were those guides for me, but I was just operating off my own imagination and my own sort of… sense of what I’d like to see or what I, what I think these characters could be going. But — now they really understood it and, and Jon, in particular, who stayed throughout the production, was — he is encyclopedic. He’s awesome and in terms of contributing those sort of things, you know, and sort of evaluating them. 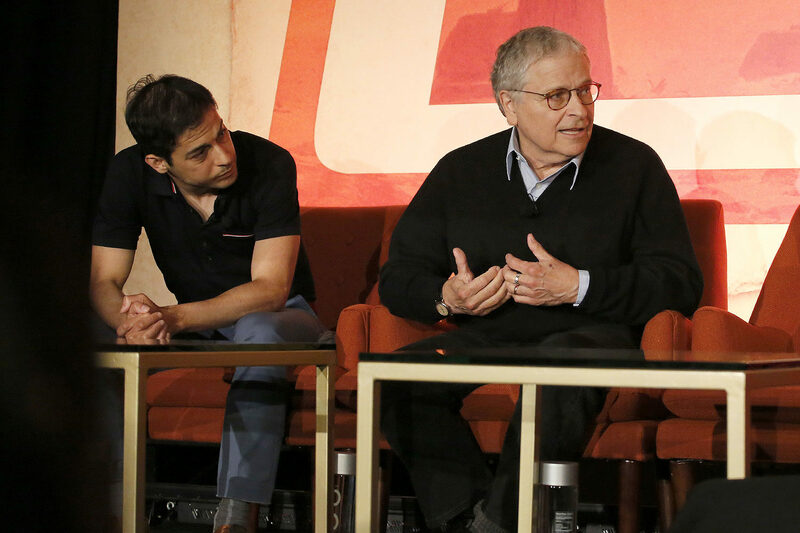 LAWRENCE KASDAN: (on writing for Star Wars) Well, when I got involved back on The Empire Strikes Back, I don’t think I ever thought of it, oh, this is Star Wars, Star Wars, Star Wars. I thought… what had gotten me when I had no connection to it, on A New Hope, but this is a great story. And George had set up something that could go off in many different directions and that would be wonderful for a long time. And I’ve never really changed my opinion of that. It happens to be a Star Wars story, but I always first, we were trying to tell a story that would keep you interested — you meet these people and you say, well, that’s a great person and now they’re meeting a great person. And they’re going to be in a lot of trouble together. And that is much more important to me than any particular Star Wars. JONATHAN KASDAN: Yeah, and we approached the movie much more in terms of… is there a kind of genre movie, a crime movie, a… a western that we could fit Han Solo into a character that we loved that that comes out of a great tradition of Bogart characters and McQueen characters and say, okay, how do we… plug that guy into the kind of movie we love and the kind of story we want to see and in doing so, we’re able to sort of have along the way these moments that are familiar and that people connect with because they have personal relationships with these characters and it gives it an added level of sort of pleasure, I think. But at its base it’s, it’s really trying to be its best version of us, of a western, or of a crime movie. 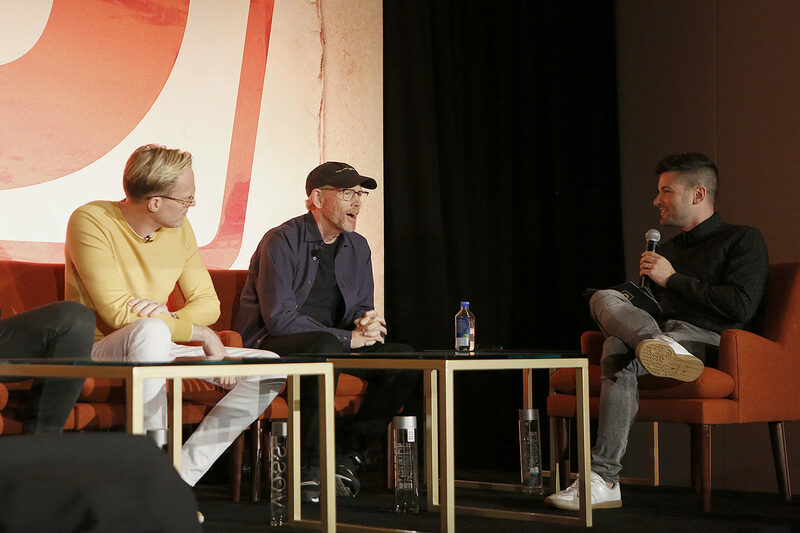 Following the panel we did ask Ron Howard directly about Willow 2, which many other members of the press have asked as well in their own interviews. For us, he said that they were working on something and it might be made into a TV series. So, here’s hoping! David Yeh, thanks so much for the post.Much thanks again. Really Cool.